Features •	Convenient system gives you the flexibility to handle various types of grinding, brazing and cutting operations all with one face shield. •	Combines a full-face clear anti-fog window with a flip-down ir window, providing uninterrupted protection for a variety of operations. 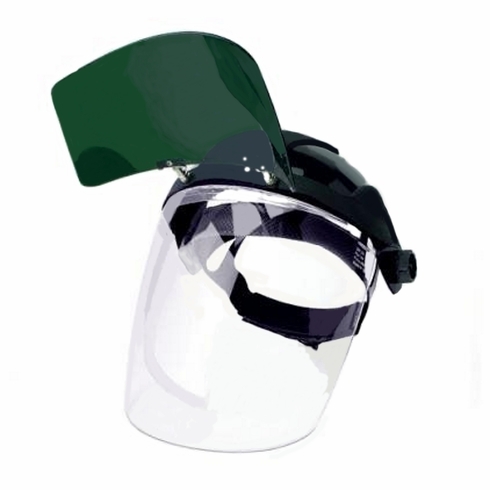 •	Shade 5 or 6 ir flip-up option ideal for uninterrupted protection during grinding, chipping, and brazing operations. •	Shade 6 cobalt blue flip-up option diffuses the orange glow that strong sodium emissions generally produce, allowing the user to see and perform more efficiently. This is ideal in gas welding applications for aluminum and cast iron as well as in metal, gas & glass furnace operations. •	The shield curves naturally to fit facial contours ensuring reliable protection from splash, particles and flying debris. •	Ratchet headgear suspension allows user to adjust size and tighten at the turn of a knob. •	Meets ansi z87.1 + high impact standards & cul certified to meet can/csa z94.3 standards. (note exceptions).